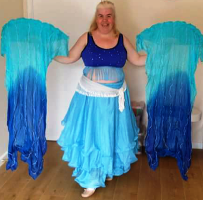 "I just wanted to say thank you for your private teaching on how to dance baladi and for your support, without which I would not have been able to perform on Saturday, let alone get the amazing comments I did. Many, many thanks." 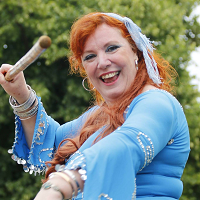 – Trish Marriott – Bellydance Professional and Student at our Wokingham Intermediate & Advanced class. "I am a very passionate person and dancer, therefore always wanting to learn new things and broaden my dance knowledge, I recently decided that I would like to use props such as Isis wings and fan veils more in my performances. I performed with Rachel in the Dance Queens of the Nile at the Bloomsbury theatre, London and after seeing her phenomenal performance with Isis wings, I thought: who better to ask to than her? I booked a private session with Rachel and I enjoyed it thoroughly. Although myself and Rachel have been friends for years, she was very kind and professional. Rachel had carefully planned our session; she offered a wide repertoire of moves, poses, frames and combos and explained and demonstrated each one with such clarity and grace. I feel I have a lot of exciting new things to work with and I am truly looking forward to it. Rachel is one hell of a teacher and friend and she definitely has a gift, not only as a fabulous dancer but as a fantastic teacher and events organiser." "I attended a stage presence workshop with Rachel in 2014 and more recently a professional bellydance hair and make-up private lesson. Rachel is exceedingly knowledgeable and a very warm and generous teacher. I came to her feeling rather nervous and unsure about wearing and applying stage make-up, yet feeling that change was needed all the same. Rachel understood my trepidation and put me at ease straight away, working with my favourite colours to create a look that was stage worthy, suitably 'bellydancey', but still recognisably me. During my private lesson I felt completely supported and empowered to try out everything I was being taught. By the time I left, I felt that I not only had been given loads of fantastic information and knowledge, but I had also developed the confidence to apply and experiment with it, thanks to Rachel's gentle encouragement and positive regard. I recommend her very highly!" "I have been a student with Rachel Bennett since 2011. Rachel's classes are always upbeat and fun with safe and knowledgeable tuition. Rachel is enthusiastic about all of her students with differing abilities and has a way of making everyone feel good about ourselves regardless of size or age. Rachel gives her students plenty of opportunities to shine at shows and events and has taught me many different styles of belly dance. Rachel has helped me to push myself to perform solos at some larger events recently with the help of some private tuition. She has inspired me with my new found love of isis wings and has helped me to be more polished in my performance technique. Thank you so much Rachel for all your support." "Rachel has always been an inspiring teacher, always encouraging her students to excel further. 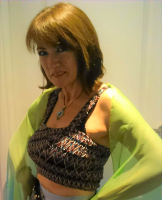 When I decided to start up my belly dance society at the University of West London, to teach belly dancing and increase awareness of this beautiful dance form, I approached Rachel for guidance. Rachel was supportive, understanding and answered all my questions in depth. I was able to successfully launch the belly dance society. I later attended some refresher classes with Rachel and her workshop on stage presence and performance, which were extremely beneficial to me, as Rachel is always sharing her wealth of dance knowledge unreservedly for the benefit of her students. I found my confidence within myself and my dancing improved drastically, just by attending a few dance classes and private tuition with Rachel. 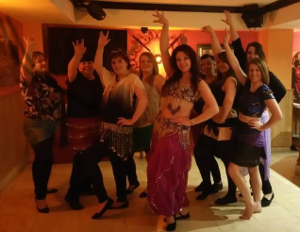 I would highly recommend Rachel to all budding belly dance performers, professionals and teachers." 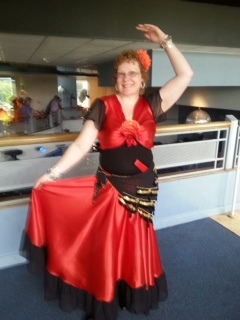 "I have an interest in fusion belly dance (eg samba, bolly etc) and had decided a long time ago to learn some Polynesian! After Rachel performed a beautiful dance at my showcase (The Silk Route Show), I asked her for a lesson, to get me started !! What a super afternoon it was!! Rachel was prepared and organised for me, we discussed the lesson through, worked the moves, corrected them and chatted along the way! She made me feel at ease, taught me in a kind and patient manner and even though we have known each other for several years now, she kept the lesson professional and informative. Thank you again Rachel." "I have had the good fortune of learning from Rachel on several levels: enchanted member of audience watching a graceful dancer, inspired Princess of the Orient (as a student and teacher trainee), and as a private student. She is thorough, exacting and infinitely helpful, a teacher and coach who demands and elicits much more out of me than I believed possible. Rachel doesn’t teach to a formula, but rather, helps me improve my own dance, performance and teaching skills. She is always prepared to give just that little bit more, allow me to explore a bit deeper, and encourage my creativity. I can’t wait to put into practice all that she’s taught me! I will certainly continue to learn from Rachel, and heartily recommend her to anyone who wants to expand into teaching." 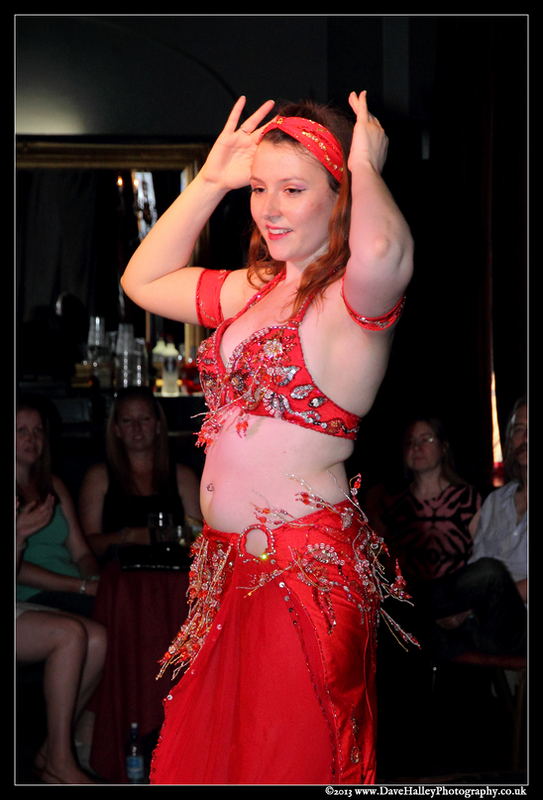 "Bellydance lessons with Rachel Bennett are perfect for ensuring that I get a good workout while enjoying the dancing. I love keeping fit while enjoying and expressing myself - a great combination!" "Rachel's sparkling personality, energy and enthusiasm inspire me to become a better dancer and to explore the magical world of belly dancing. Rachel particularly pushes me to improve my performance , which is not something that comes naturally to me, in particular my stage presence and facial expressions." "There's a fabulous atmosphere during the classes. Rachel is always welcoming, enthusiastic and upbeat. Very well thought through lesson plans with a clear structure and progression. Complete and reliable backup materials sent through in a timely way for choreographies. Plenty of variety from one term to the next and great layered teaching so there is always something else to take from a lesson whatever level you're at. Rachel's passion and enthusiasm really come through in her teaching." ...as a beginner taking private classes alongside Rachel's weekly classes. ...then to assist me with personal dance studies (Hossam and Serena Ramzy School of Music and Dance). 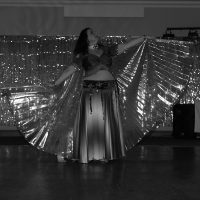 ...as a fellow performer at bellydance showcases and charity events. ...and finally helping me to become a bellydance teacher myself. So as you can see, Rachel has a wealth of knowledge to help you along every step of the way. I am now more confident and knowledgable (even with the boring stuff...tax/insurance/forms etc). Rachel is brimming with positivity and enthusiasm and is a joy to be around. I can't recommend her enough." "I would just like to say that your classes have been the best form of exercise for me, apart from my horse riding, the incentive is there to keep going as we are learning a dance routine and reaching an end product rather than just going to the gym and doing same old, same old. Thank you for all you do for us." "Rachel is a British bellydancer, with a captivating, warm and fluid style, rooted in strong Classical Egyptian /Golden Age tradition. She is known amongst Arab/Middle Eastern for her authentic takes on Classic Egyptian songs and music, which has got to be one of the best compliments for an Egyptian style. Her knowledge of Egyptian dance is very thorough. Her enthusiasm and passion for this dance is very infectious, which gives her students much encouragement and motivation. I've known Rachel over the years, and have watched her evolve in dancing and teaching." - Maureen Pemberton, Tribal Bellydance Teacher, Birmingham and Private Student with Rachel Bennett School of Bellydance Photo by Donna Gardner/ Urban Tarab. "A couple of years ago I had to put together an important performance with only a few weeks' notice. Although I normally prefer to choreograph my own numbers, as I was pushed for time I decided to book a session with Rachel and explained to her that I needed a tasteful and elegant choreography that I needed to be able to learn very quickly. She really took the time to understand my needs, and as a result the music and choreography she chose were just right. She was a very warm, supportive and encouraging teacher, and her ability to break down the moves and - in some instances - slightly adapt them to best suit my own style and body shape on the fly meant that not only was I able to get ready for my performance despite having very little time to practice, but the audience was absolutely delighted and I received many compliments for it. I would definitely recommend Rachel's tuition to all dancers regardless of their level of development." “The reason I am your longest standing student [since 2009] is because of you and your great classes and choreographies. Even on the coldest winter nights when it would be far easier to stay indoors you make it worth the effort. You have a sparkling personality and are always so positive, kind and generous with your comments.” - Angela, Wokingham. “I wanted to tell you also that these 2 years have been so amazing. Apart from learning the art of bellydance I feel so much fitter and more confident; not just dancing in front of people, but in my daily life too and it is so such wonderful community I am in. All the dancers are so nice and supportive; it’s nice to see women embracing women and our beauty.” - Rosa, Wokingham. 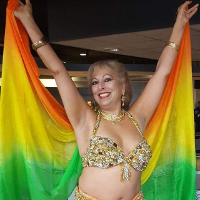 "I joined Rachel Bennett School of Bellydance, “Princesses of the Orient” class, in 2012 after attending a Bollywood fusion workshop with Rachel that summer. I really enjoyed the energy and positivity of the workshop. Rachel's endless enthusiasm guaranteed that I was smiling from the moment I walked into class and I knew that I would learn a lot from her wealth of knowledge and experience! In addition to group classes, since summer 2014, I've also had private classes with Rachel on stage presence and classical Egyptian choreography. Thanks to Rachel's guidance, I was able to piece together a solo choreography to the Cairo Orchestra's arrangement of “Ana Fi Intizarak” – a style of music that, to begin with, was totally out of my comfort zone! I was then given the opportunity to perform the choreography at our end of term show in December 2014 which, as well as being so much fun, gave me a real sense of achievement! Bellydancing has really changed my life. Not only have I made lots of wonderful friends, I've also gained some real insight into myself. I've learned to accept my body as it is and feel more confident in my own skin. What I love most about bellydance is that the students and teachers come from all walks of life, are of different shapes, sizes, ages and backgrounds and always very encouraging and very supportive! 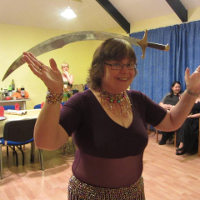 Rachel has always been a warm and generous teacher, sharing her passion for bellydance with all of her students. She's been a real inspiration to me, both as a dancer and as a teacher, and I'd love it if one day I too could inspire other women to join bellydance and see it enhance their lives in the same way it did mine!" “Ooooh er what have I done? This year I thought it would be a good idea to learn how to pass on to other people the delights of our wonderful dance. So I signed up to Rachel’s Teacher Training Course. I was given a course timetable along with course materials, assignments and objectives so was in no doubt about what the syllabus would be and what was expected of me. Everything was clear, concise and well organised. For the first six weeks my task was to observe, each week taking specific areas to look at from the list supplied by Rachel – each week I submitted a report on those observations. Rachel used the report as a tool to guide me and point out areas for development. The second part of the course was practical. Using the knowledge gained from my first six weeks I was asked to take warm ups, cool downs, teach a move and ultimately teach a short choreography all of which would be observed by Rachel. To say I was rather nervous at this point is putting it mildly. I needn’t have been. The feedback and pointers I received were invaluable. Under Rachel’s guidance each week I became more confident about what I was going to do and how to deliver it. The feedback was sincere and honest and nothing was too much trouble for Rachel, she gave generously of her time and knowledge to help me not only get through the course but to be confident about what I was doing. Go back to the teaching page. Go back to the booking page. 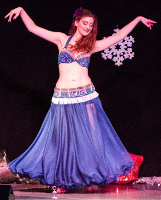 To engage Rachel for bellydance performances, classes, workshops and private lessons, please contact her on email .